Download "LONGVIEW POWER PLANT POLICY AND PROCEDURES MANUAL"
1 LONGVIEW POWER PLANT POLICY AND PROCEDURES MANUAL Title: Procedure Number: L1 - ADM - 1JD - MPT - R Rev. Number: 1 Maintenance Planning Technician Rev. 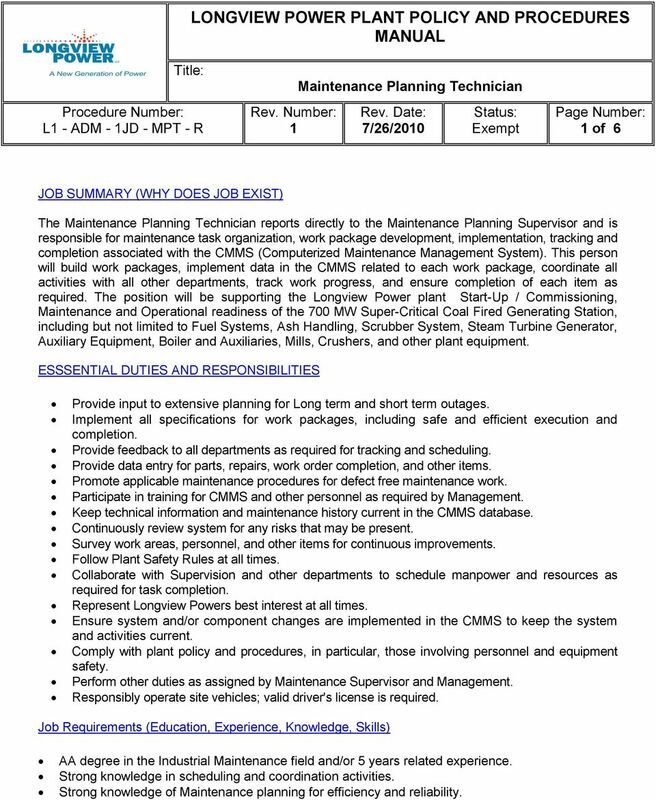 Date: 7/26/2010 Status: Exempt Page Number: 1 of 6 JOB SUMMARY (WHY DOES JOB EXIST) The Maintenance Planning Technician reports directly to the Maintenance Planning Supervisor and is responsible for maintenance task organization, work package development, implementation, tracking and completion associated with the CMMS (Computerized Maintenance Management System). This person will build work packages, implement data in the CMMS related to each work package, coordinate all activities with all other departments, track work progress, and ensure completion of each item as required. 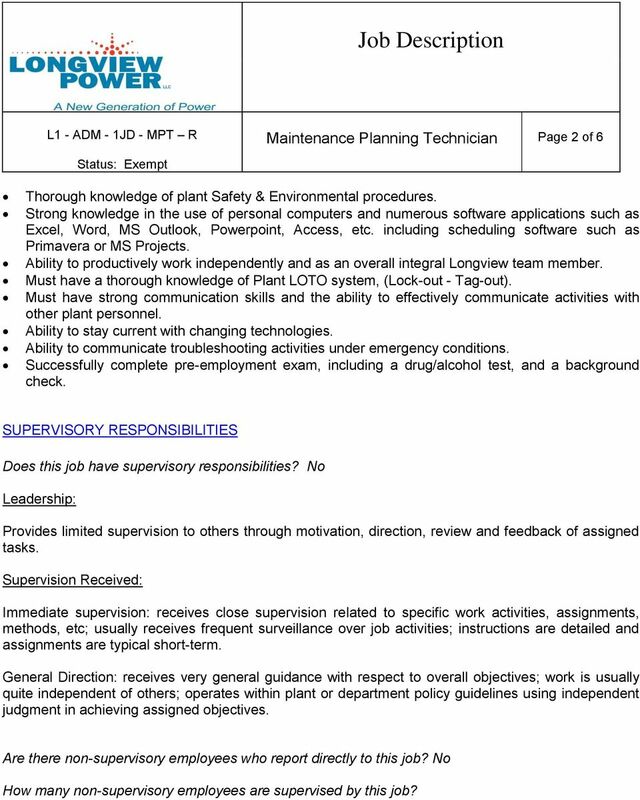 The position will be supporting the Longview Power plant Start-Up / Commissioning, Maintenance and Operational readiness of the 700 MW Super-Critical Coal Fired Generating Station, including but not limited to Fuel Systems, Ash Handling, Scrubber System, Steam Turbine Generator, Auxiliary Equipment, Boiler and Auxiliaries, Mills, Crushers, and other plant equipment. ESSSENTIAL DUTIES AND RESPONSIBILITIES Provide input to extensive planning for Long term and short term outages. Implement all specifications for work packages, including safe and efficient execution and completion. Provide feedback to all departments as required for tracking and scheduling. Provide data entry for parts, repairs, work order completion, and other items. Promote applicable maintenance procedures for defect free maintenance work. Participate in training for CMMS and other personnel as required by Management. Keep technical information and maintenance history current in the CMMS database. Continuously review system for any risks that may be present. Survey work areas, personnel, and other items for continuous improvements. Follow Plant Safety Rules at all times. Collaborate with Supervision and other departments to schedule manpower and resources as required for task completion. Represent Longview Powers best interest at all times. Ensure system and/or component changes are implemented in the CMMS to keep the system and activities current. Comply with plant policy and procedures, in particular, those involving personnel and equipment safety. Perform other duties as assigned by Maintenance Supervisor and Management. Responsibly operate site vehicles; valid driver's license is required. Job Requirements (Education, Experience, Knowledge, Skills) AA degree in the Industrial Maintenance field and/or 5 years related experience. Strong knowledge in scheduling and coordination activities. Strong knowledge of Maintenance planning for efficiency and reliability. 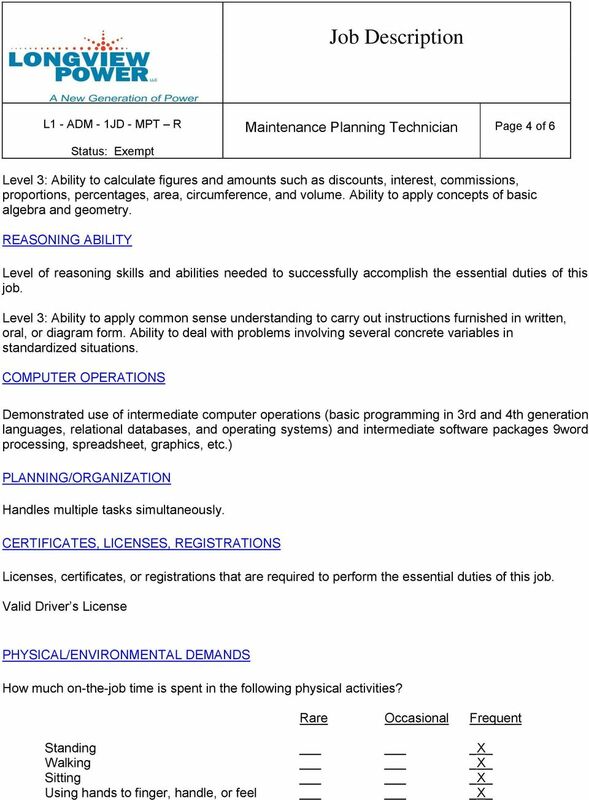 2 Maintenance Planning Technician Page 2 of 6 Thorough knowledge of plant Safety & Environmental procedures. Strong knowledge in the use of personal computers and numerous software applications such as Excel, Word, MS Outlook, Powerpoint, Access, etc. including scheduling software such as Primavera or MS Projects. Ability to productively work independently and as an overall integral Longview team member. Must have a thorough knowledge of Plant LOTO system, (Lock-out - Tag-out). Must have strong communication skills and the ability to effectively communicate activities with other plant personnel. Ability to stay current with changing technologies. Ability to communicate troubleshooting activities under emergency conditions. Successfully complete pre-employment exam, including a drug/alcohol test, and a background check. SUPERVISORY RESPONSIBILITIES Does this job have supervisory responsibilities? No Leadership: Provides limited supervision to others through motivation, direction, review and feedback of assigned tasks. Supervision Received: Immediate supervision: receives close supervision related to specific work activities, assignments, methods, etc; usually receives frequent surveillance over job activities; instructions are detailed and assignments are typical short-term. General Direction: receives very general guidance with respect to overall objectives; work is usually quite independent of others; operates within plant or department policy guidelines using independent judgment in achieving assigned objectives. Are there non-supervisory employees who report directly to this job? No How many non-supervisory employees are supervised by this job? 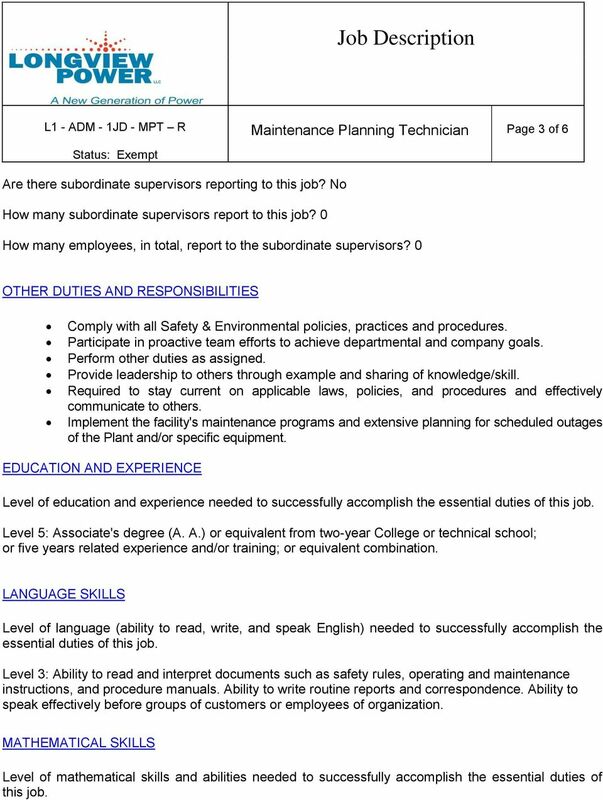 3 Maintenance Planning Technician Page 3 of 6 Are there subordinate supervisors reporting to this job? No How many subordinate supervisors report to this job? 0 How many employees, in total, report to the subordinate supervisors? 0 OTHER DUTIES AND RESPONSIBILITIES Comply with all Safety & Environmental policies, practices and procedures. Participate in proactive team efforts to achieve departmental and company goals. Perform other duties as assigned. Provide leadership to others through example and sharing of knowledge/skill. Required to stay current on applicable laws, policies, and procedures and effectively communicate to others. Implement the facility's maintenance programs and extensive planning for scheduled outages of the Plant and/or specific equipment. EDUCATION AND EXPERIENCE Level of education and experience needed to successfully accomplish the essential duties of this job. Level 5: Associate's degree (A. A.) or equivalent from two-year College or technical school; or five years related experience and/or training; or equivalent combination. LANGUAGE SKILLS Level of language (ability to read, write, and speak English) needed to successfully accomplish the essential duties of this job. Level 3: Ability to read and interpret documents such as safety rules, operating and maintenance instructions, and procedure manuals. Ability to write routine reports and correspondence. Ability to speak effectively before groups of customers or employees of organization. MATHEMATICAL SKILLS Level of mathematical skills and abilities needed to successfully accomplish the essential duties of this job. 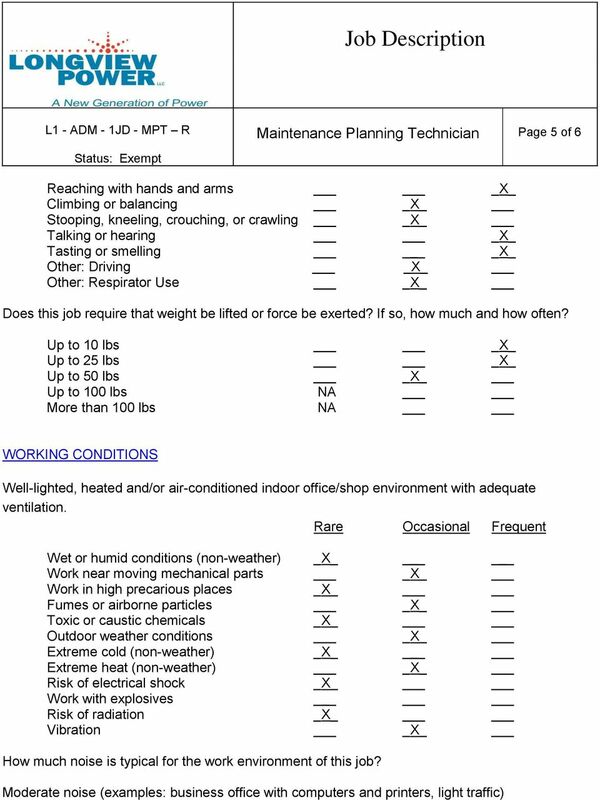 6 Maintenance Planning Technician Page 6 of 6 TRAVEL Minimal overnight travel (up to 10%) by land and/or air.